Stuff Points: Earn 1 points when you buy this stuff. Not quite as good as our premium quality lens, screen and polishing cloths, but still way better than most of the garbage sold elsewhere. Use this polishing cloth to clean any material, and leave it shiny and new looking. It's great for gemstones, jewelry, crystal, glasses and electronics, but the versatile material is safe and effective on almost any surface. Use it dry for daily buffing, or get it damp for that once-in-a-while deep cleaning. A single swipe will eliminate 99% of all dirt, and then leave the surface totally free of any spots, streaks or lint. You don't need any extra cleanser, wax, or polish, but you can use any kind if you want to. The material alone works amazingly well when dry, and if you add water, it becomes supercharged to provide incredible cleaning power that's totally eco-friendly. Stop wasting money on expensive products that don't work any better, and don't struggle with mediocre materials any longer. Try this economical polishing cloth to make everything sparkle without breaking the bank. Affordable. Amazing quality at a low price. Pay the same amount elsewhere, and end up with a slippery piece of fabric that's smaller, and nearly useless for the job intended. Choose this one instead, and watch smudges, greasy build up and other dirt disappear. Effective. Other cloths will require special pastes and liquids to go along with them. This one does not. The incredible material does all of the work for you, and it is highly effective. Just wipe to reveal a clean and shiny surface with little effort. Fast. No multiple step process, and nothing to go and get. Use the cloth alone to do the whole job, and wipe only once to clean and polish at the same time. Reusable. Don't toss after just one use, reuse over and over again with nothing more to buy. Washable. Machine wash just like any other laundry, to bring the material back to like new condition. Each cloth can be laundered hundreds of times before replacement is necessary. High Quality. We do carry cloths that are slightly better, but this one is pretty good, and it easily outperforms most alternatives sold elsewhere. Safe. Never worry about scratching, marking, discoloration, abrasion or any other harm. Cleaning and polishing with these is totally safe, and you never run any risk of damage. The advanced material is completely safe, highly durable, and extremely effective so there are literally hundreds of jobs and surfaces that it would be compatible with. Check out the list below to get any idea of what it can handle, but use with confidence on anything that is similar too. TV's, computers and much more. This polishing cloth is pretty awesome, but we do carry several other options for those looking for a different size, or for a anyone interested in a premium quality option. This one is made from the same material as our Phone Cloth, so if you want a smaller version of this one, check it out. We sell them individually, or in a ten pack. Our other cloths will be a bit higher quality than this one and the phone one, and they come in a wide range of sizes. To check out similar tools in a variety of size and finish options, use the following links: Premium Lens Cloth (5" x 8"), CD/DVD Cloth (8" x 8"), Camera Cleaning Cloth (9" x 10.25"), Tablet Cloth (12" x 8.5"), Screen Cloth (12" x 12") or Polishing Cloth (16" x 16"). Cleaning and polishing with this remarkable cloth is super easy, and the results are guaranteed. In most cases you will only need to use it dry, but you can also add waxes or polishes if desired. To supercharge your ability without buying anything else, add some water and use the cloth damp. When you use it, you essentially just wipe, but follow the steps and suggestions below for best results. When used dry, just wipe the surface to clean common dirt and smudges while buffing to a shiny finish. When using with additional polishes, use as directed based on that product, and see your results improve by applying and buffing with this cloth. To use wet, hold under the faucet to wet, then remove and wring out until no longer dripping. Once damp, wipe like normal. When cleaning or polishing, use a continuous motion, and move in a single direction for better results. Work from one side to the other to ensure no spot gets missed. When cleaning jewelry, grab with the cloth between your fingers and rub to a lustrous shine. When working with electronics, use as little moisture as possible, and for maximum safety, turn off prior to cleaning. Safe for use on any surface, it will never leave a mark, or drop any lint. Machine wash when necessary. Use any detergent you like, but avoid fabric softeners and bleach. Tumble dry or hang. Don't get fooled by similar looking products sold elsewhere, because all microfiber is not created equal. If you want an easy-to-use cloth that will last for years, and clean like crazy, then order from us. If you want something that looks similar but is a pain to actually use, then shop elsewhere. 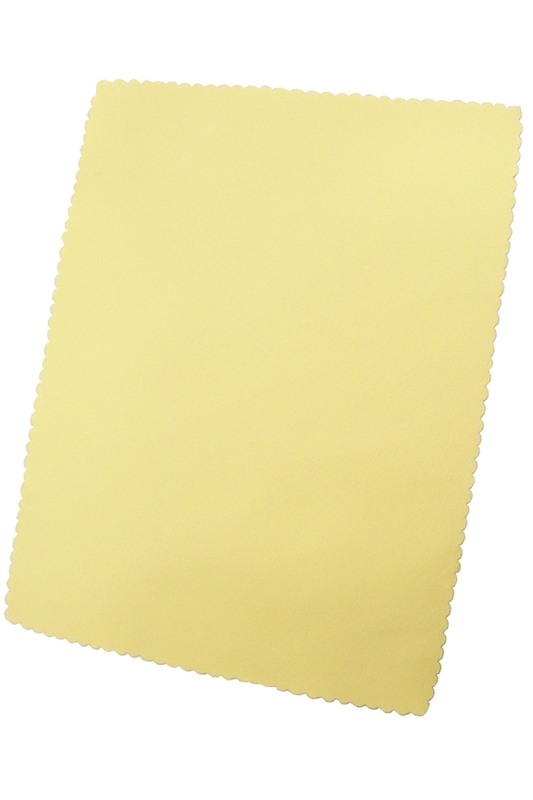 This polishing cloth is guaranteed to work, and the durable material will provide thousands of uses. You won't have to wipe over the same spot a million times to get it clean, and you won't get annoyed by lint and other debris that gets left behind. For powerful cleaning ability, and a tool that polishes surfaces with incredible ease, our cloth is one of the best choices available. Just whip it out and wipe away to make almost anything clean and shiny again. Uses Clean and polish almost anything. Perfect for delicate surfaces like jewelry, glasses and electronics. Remove 995 of dirt and germs with a dry or damp cloth, and shine the surface at the same time. Washable Yes. Machine wash and tumble dry. Do not use fabric softener or bleach. Better material for better cleaning. Easily shine and polish while leaving the surface totally clean. Perfect for gems, metals, crystal, glass and more. Order Yours Today! This is a nice oversize cloth for cleaning glasses, cell phone and tablet screens. Stands up to washing. Don't use fabric softener or dryer sheets. Professional Quality Supplies For Cleaning Your Car. Specially Designed for Eyeglasses, Sunglasses, Optical Lenses & More. High Quality Cloths for Camera Lenses, Touch Screens & More. An Easier Way To Clean. No Chemicals Necessary!